The use of removable dentures stabilized by osseointegrated implants may improve the quality of life of edentulous patients. Overdentures (OVD) are removable dental prostheses that cover and rest on one or more remaining natural teeth, the roots of natural teeth and/or dental implants improving stability and reducing ridge resorption. 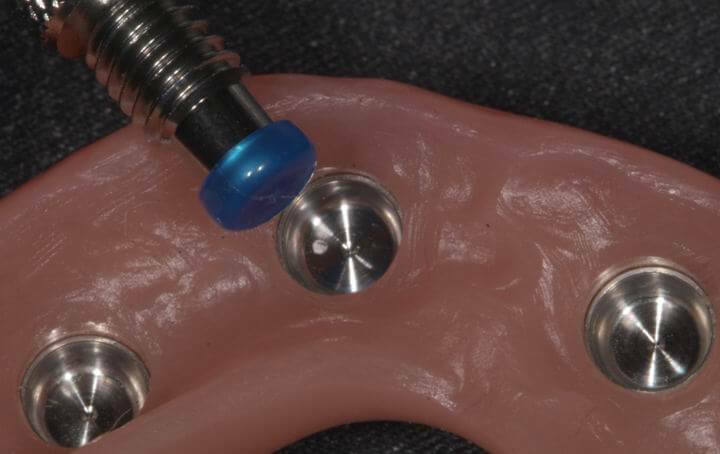 Such implant-supported prostheses represent a compromise solution between the advantages of fixed prostheses and traditional complete removable dentures in totally edentulous patients. In scientific literature good adaptability was reported in edentulous patients provided with maxillary complete removable dentures, whereas phonetic and functional problems due to prosthesis instability were lamented by patients wearing mandibular complete removable dentures. 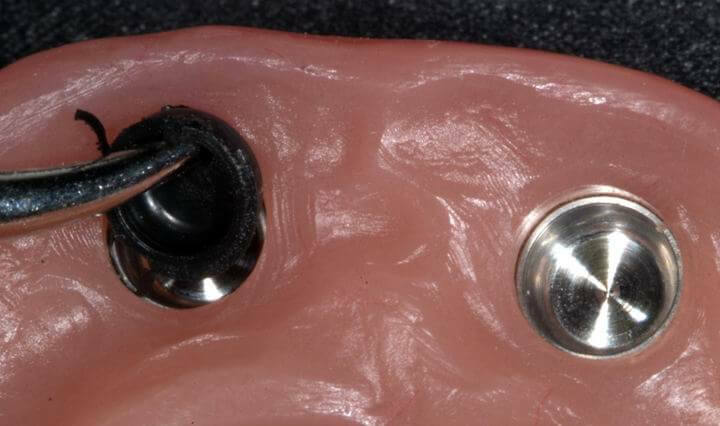 As to implant-supported OVDs, several advantages were pointed out just like improvement of chewing ability in comparison with traditional complete removable dentures, esthetic and phonetic improvements, lower susceptibility of the success of the rehabilitation to the optimal insertion of implants than fixed prostheses. Notwithstanding the mandibular residual ridge resorption, a sufficient amount of bone tissue often remains in the interforaminal region to properly insert at least 2 implants. The presence of 2 or 4 osseointegrated implants in such area seems not to affect the long term success of OVDs: as to retention, stability, stress distribution and peri-implant health, comparable results were noticed with both 2 or 4 interforaminal implants. High success rates were reported with mandibular OVDs, whereas higher failure rates were showed with maxillary OVDs. Success rates range between 92% and 100% and they seem not to be related to either the system of connection or the age of the patients. 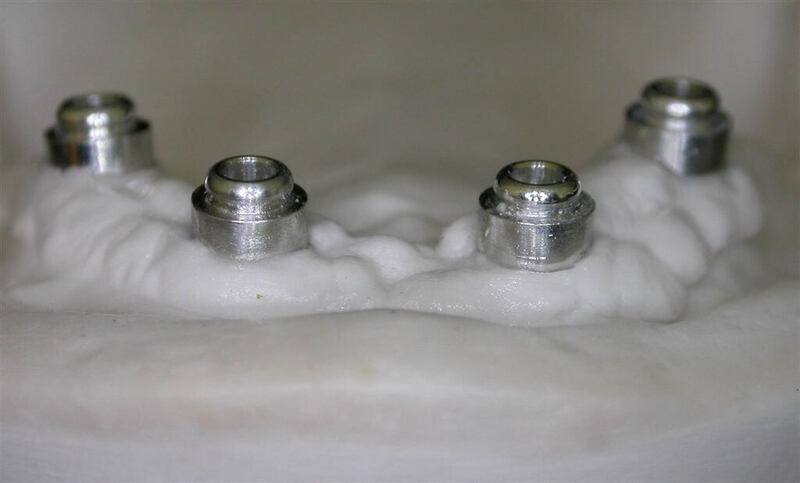 As to the supporting implant system, several studies obtained comparable results with both submerged and non-submerged implants. However, the use of the latter allows clinicians to perform one-step surgical procedures thus reducing the costs of the rehabilitation and the patients’ discomfort, in particular when treating old or defeated patients. Nowadays several retention systems for OVDs are available: bar clips, solitary ball attachments, magnets, telescopic crowns. 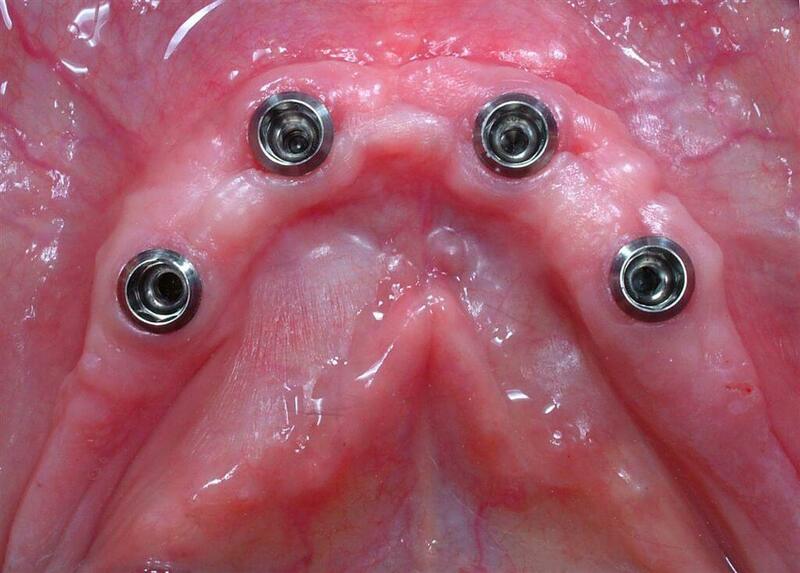 The anchorage design must be chosen after a careful evaluation of the morphology and anatomy of the edentulous arch, the position of the implants, the needs of retention, the occlusion with the antagonist arch, the hygienic habits, the economic needs and the compliance for recall of the patient. 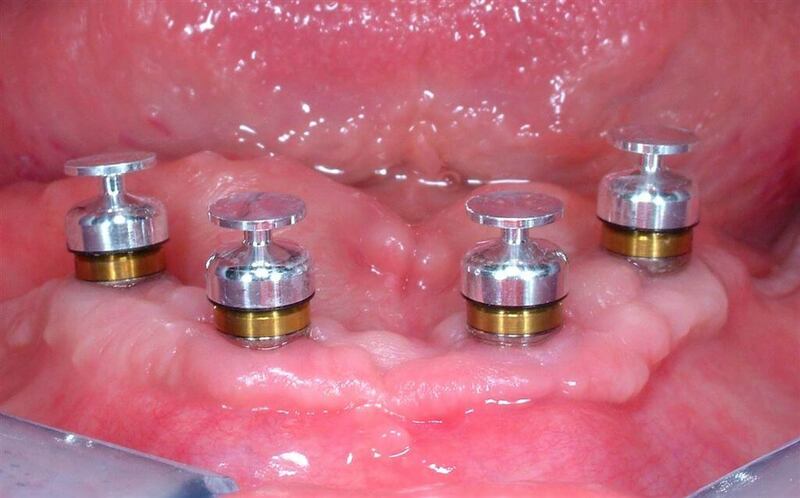 The use of solitary attachments is advisable when a satisfactory parallelism between the implants is obtained. A non-optimal insertion of the implants can be corrected by means of ball attachments provided with angulated abutments or by the innovative anchorage system of Locator®. 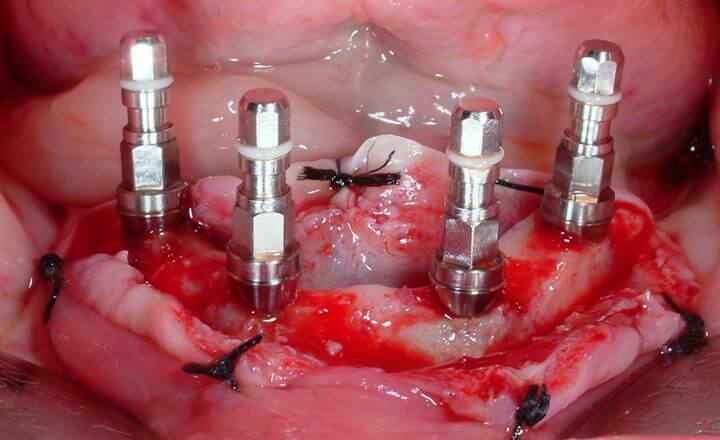 Solitary attachments can follow the functional distortions of the mandible because of the absence of a rigid connection; as a consequence, most of the stress concentrate at level of the symphysis avoiding implant overload. Although bars are more retentive, ball attachments are less technique sensitive, easier to clean and less costly. Controversy persists as to whether the bar clips or the ball attachments requires more maintenance. Moreover, the use bar retention systems is affected by jaw anatomy and might result in functional limitations of the tongue. The rigid connection provided by bar clips causes lower bone resorption but higher peri-implant bone stress concentration than solitary attachments do: consequently mechanical complications might occur as bars badly withstand non axial forces. The Straumann Locator® system is a non-rigid connection anchorage using innovative solitary attachments. It is provided with self-positioning components with different height. This results in several advantages for both clinicians and patients, such as rehabilitations in case of limited denture space, easy maintenance and replacement of the retentive components, easy insertion and removing of the prosthesis. Moreover, the Locator® system can be used to compensate eventual divergence of up to 40° between two implants. A 63 years old non-smoker female patient was interested by complete mandibular edentulism due to previous chronic periodontitis (1,2). 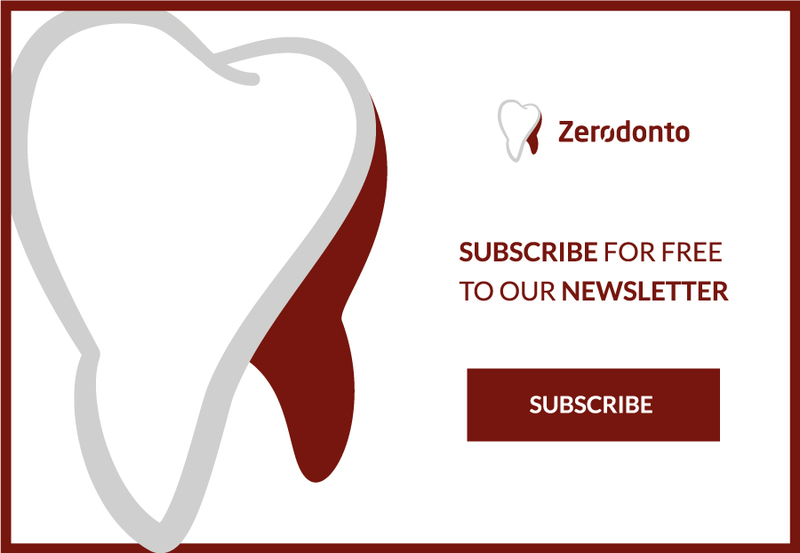 The patient had been previously provided with a mandibular complete removable denture antagonist to a maxillary metal-ceramics full-arch bridge. The patient complained about the stability and retention of the denture asking for mechanical anchorage of the prosthesis. The lack of retention negatively influenced the patient’s social life weakening her self-consciousness as well. Moreover, she complained about limited function and bad chewing ability that had affected her food habits. 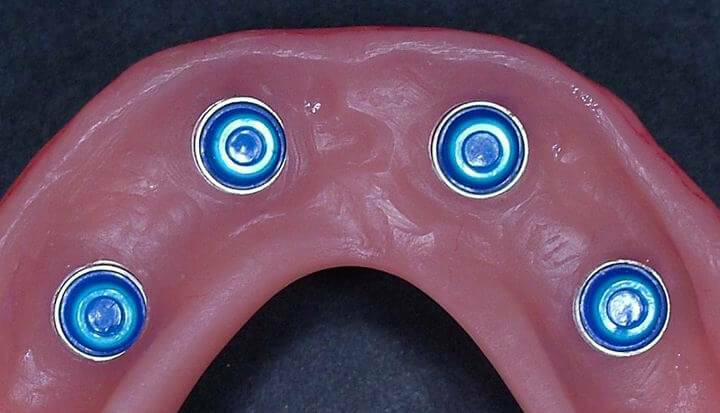 Considering her psychological attitude and the economic needs, the patient was asked to sign a written consent form and it was decided to realize a new implant-supported OVD by inserting 4 Straumann implants and the innovative Locator® anchorage system. 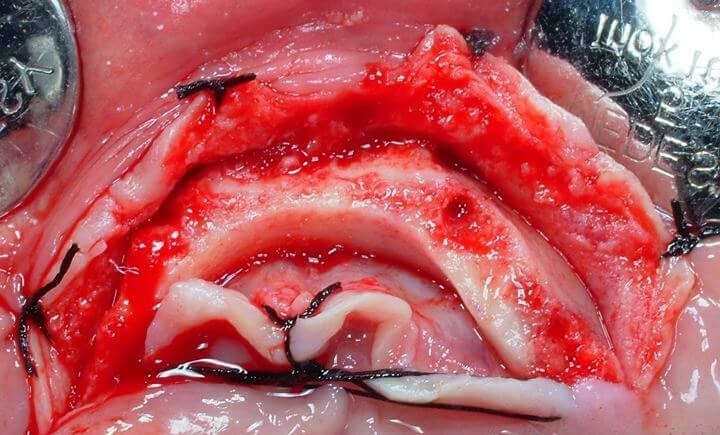 Surgical treatment: A crestal incision was performed with a 15c Bard Parker blade and a full-thickness flap was elevated preserving a sufficient amount of keratinized mucosa on the buccal aspect of the alveolar ridge. 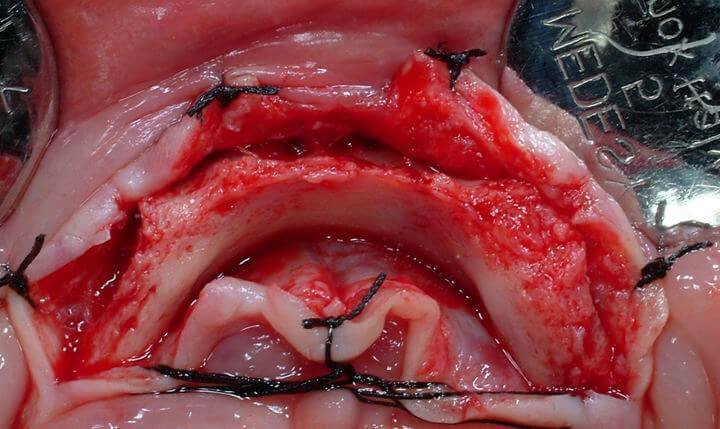 Only one midline vertical buccal relieving incision was cut and buccal and lingual spreading sutures were executed to properly visualize the surgical site (3). 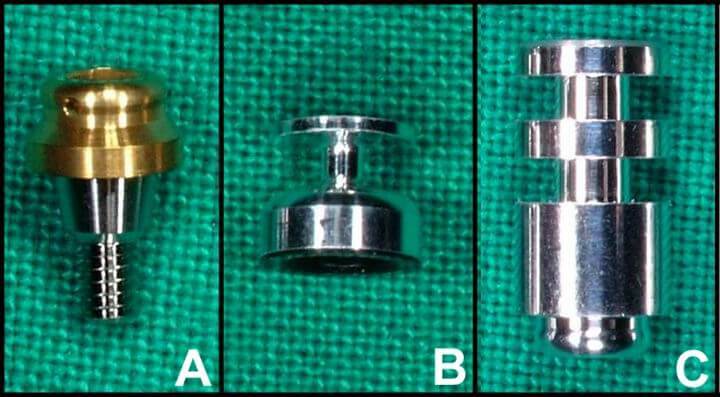 Due to thin bone margin in the most coronal part of the alveolar ridge, a horizontal osteotomy was performed by means of a tungsten carbide rounded bur mounted on a low-speed handpiece under constant irrigation of physiological sterile solution to model the alveolar ridge (4). This aimed at regularizing the alveolar ridge profile and gaining a thicker flat bone plate in the apical region of the symphysis. In order to check the quantity of bone tissue removed, the horizontal osteotomy was first performed on only one side of the interforaminal area and then it was extended to the contralateral region. The mental foramina were carefully visualized by means of a periosteal elevator. Four Straumann cylindrical implants were used: 2 Regular Neck 3.3 Ø x 10 mm distally and 2 Regular Neck 3.3 Ø x 12 mm mesially. 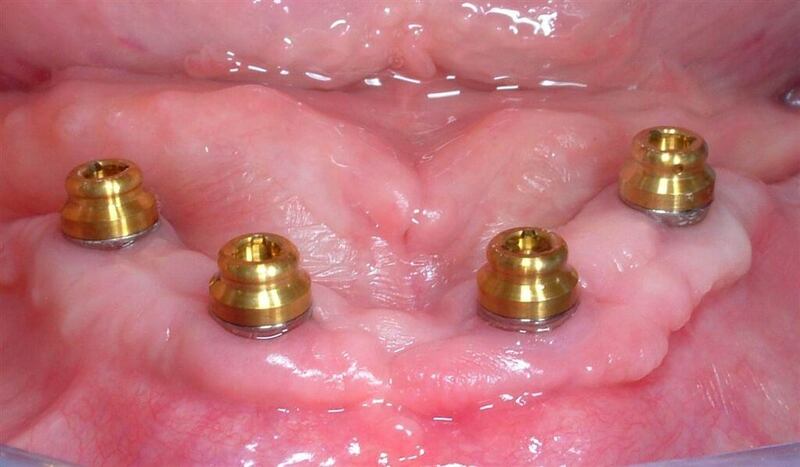 The use of 4 implants was due to the high retention needs of the patient. 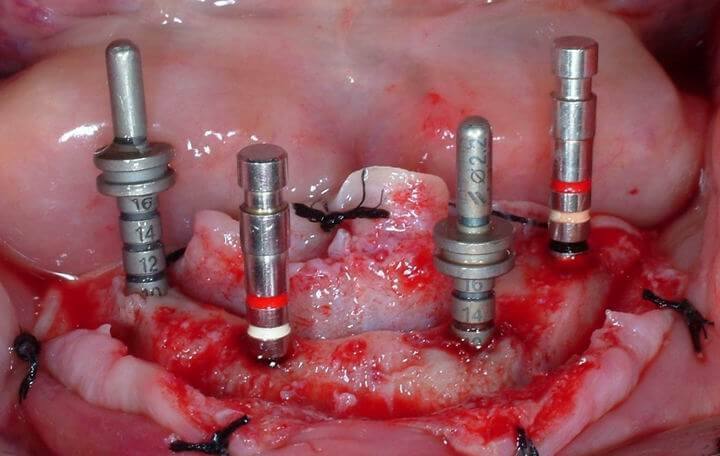 The two 3.3 Ø x 10 mm implants were inserted 7 mm mesially to the mental foramina not to damage the ansa that the mandibular alveolar nerve outlines in the symphysis area. 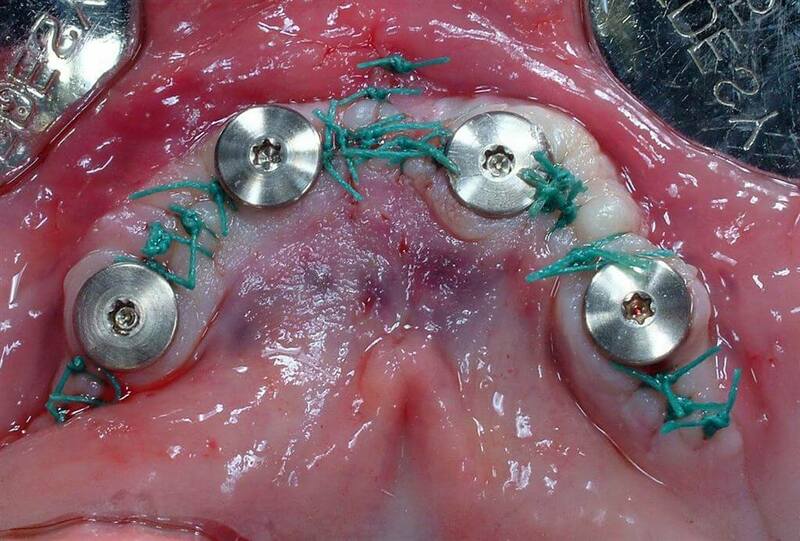 Then, the two 3.3 Ø x 12 mm implants were positioned 12 mm mesially to the most distal implants. The fixtures were positioned as parallel between them and as perpendicular as possible to the occlusal plane (5,6), taking care neither to drill the lingual cortical bone nor to damage the sublingual artery. The fixtures were covered with 1.5 mm titanium cover screws and the soft tissues were sutured with e-PTFE coated polyfilament sutures (Tevdek 3-0) (7). The patients was subjected to standard antibiotic (amoxicillin, 1 gr twice per day for 5 days) and non-steroidal anti-inflammatory (nimesulid, 100 mg twice per day for 3 days) therapies. The maintenance of oral hygiene was improved with 0.2% chlorhexidine mouth rinses for 2 weeks. 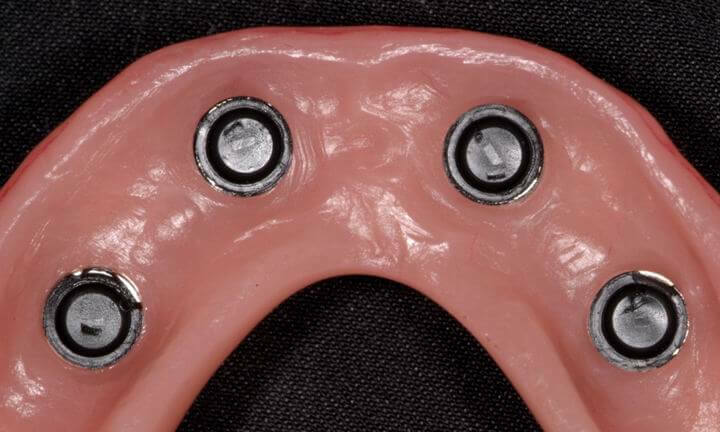 Prosthetic treatment: During the healing period, the patient wore her pre-existing mandibular complete removable denture suitably discharged and relined with a soft silicone, avoiding hard compression at level of the surgical sites. Consequently, osseointegration of the implants and proper healing of soft tissues were allowed. Three months after surgery, the healing screws were removed (8) to take the final impression using the Locator® impression kit (9). 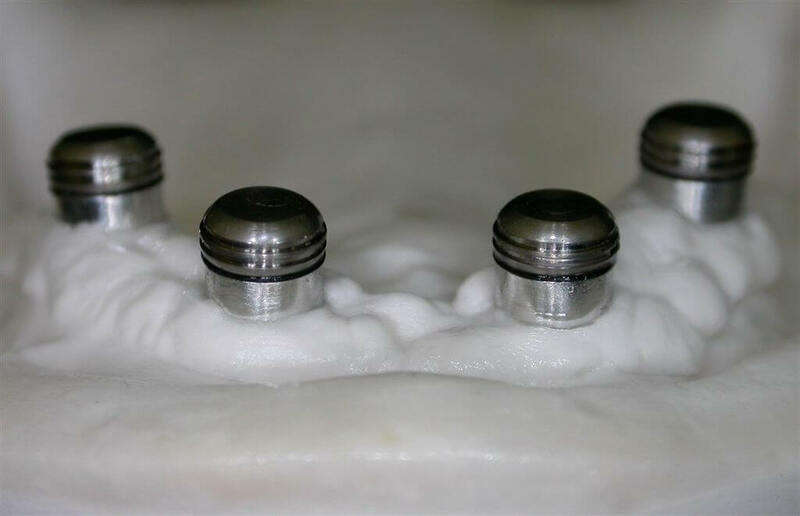 Due to the limited denture space, the 1 mm Locator® abutments were manually screwed onto the fixtures and tightened at 35 Ncm by means of a ratchet with torque control device (10). The impression copings were positioned onto the abutments (11) and the final impression was taken using an acrylic resin custom tray and polyether materials. Laboratory procedures: The laboratory abutments were positioned into the impression copings and the master cast was poured with type IV gypsum (12,13). The traditional laboratory procedures required to build up a complete removable denture were followed to create the OVD. Occlusal schemes and functional movements were simulated in an articulator: no anterior contacts in the centric relation position and minimal anterior contacts in excursions were created. Then, the housing processing males (black) were removed by means of the relative tool (14,15) and replaced with the extra light retention males (blue) (16,17). In order to achieve optimal esthetics, both the artificial teeth and the denture were anatomically characterized (18). Finally, the OVD was finished and polished. 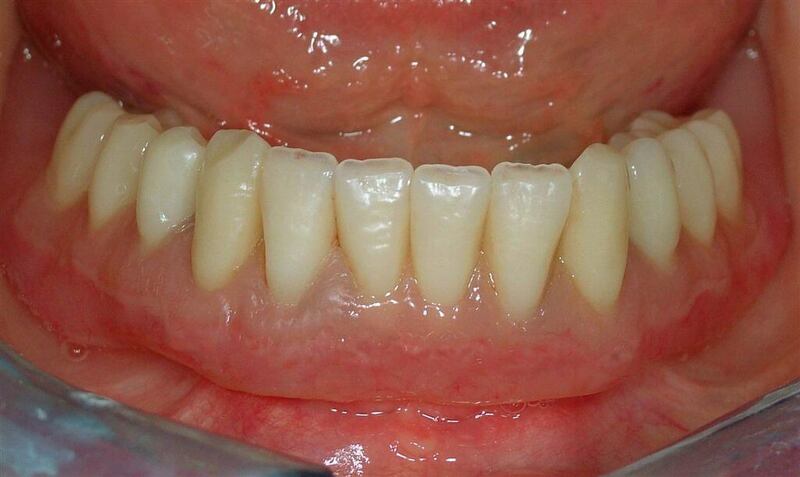 Two weeks after taking the final impression, the case was completed carefully checking the occlusion intraorally (19). The patient was recalled every week in the first month after the rehabilitation and then once a month to control the occlusion and to reline the OVD with soft silicone if necessary. 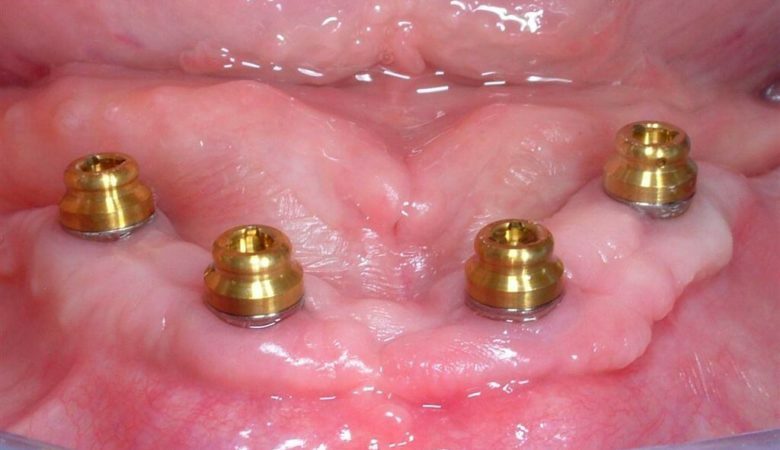 Within the limits of the present case report and the limited follow-up period (6 months), the Locator® system demonstrated very good stability allowing clinicians to restore valid chewing and phonetic functions and very good esthetics. Oral hygiene maintenance was easy and the satisfaction of the patient was optimal. 1: Naert I, Gizani S, Vuylsteke M, Van Steenberghe D.
J Oral Rehabil. 1999 Mar;26(3):195-202. 2: Geertman ME, Boerrigter EM, Van Waas MA, van Oort RP. 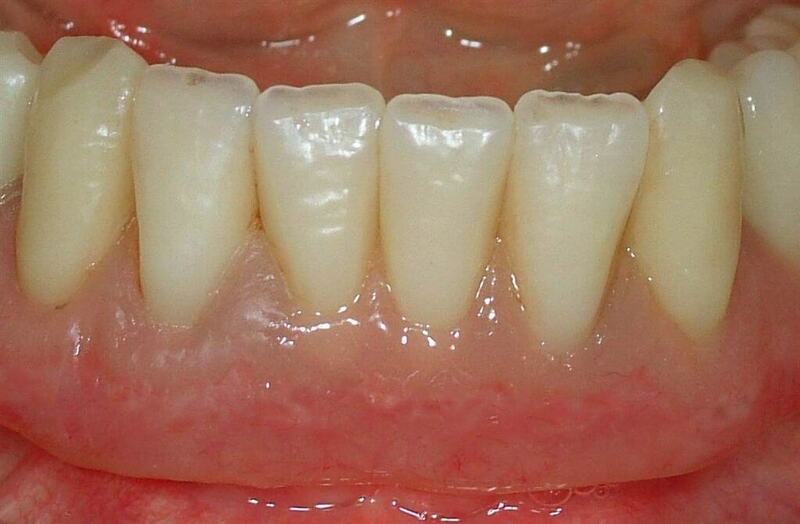 overdentures in patients with severely resorbed mandibles. J Prosthet Dent. 1996 Feb;75(2):194-204.
titanium implants: a retrospective study. Int J Oral Maxillofac Implants. 1990 Winter;5(4):375-83. 4: Meijer HJ, Starmans FJ, Steen WH, Bosman F.
consequences for the design of the superstructure. J Oral Rehabil. 1994 Jan;21(1):47-56. 5: Batenburg RH, Meijer HJ, Raghoebar GM, Vissink A.
Int J Oral Maxillofac Implants. 1998 Jul-Aug;13(4):539-45. 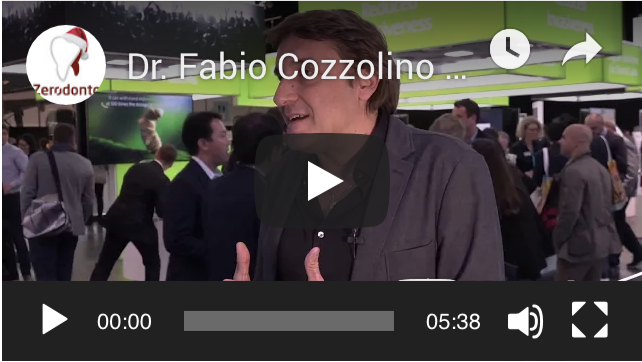 6: Ferrigno N, Laureti M, Fanali S, Grippaudo G.
multicenter study with 1286 implants. Clin Oral Implants Res. 2002 Jun;13(3):260-73. 7: Bergendal T, Engquist B.
Implant-supported overdentures: a longitudinal prospective study. Int J Oral Maxillofac Implants. 1998 Mar-Apr;13(2):253-62. 8: Mericske-Stern RD, Taylor TD, Belser U. Management of the edentulous patient. Clin Oral Implants Res. 2000;11 Suppl 1:108-25. 9: Mericske-Stern R, Steinlin Schaffner T, Marti P, Geering AH. Clin Oral Implants Res. 1994 Mar;5(1):9-18. McNamara DC, van Steenberghe D, Taylor R, Watson RM, Herrmann I.
Int J Oral Maxillofac Implants. 1996 May-Jun;11(3):291-8. 11: Meijer HJ, Batenburg RH, Raghoebar GM. overdenture in an edentulous mandible: a 3-year prospective study. Int J Oral Maxillofac Implants. 2001 Jul-Aug;16(4):522-6. 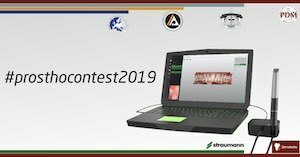 12: Romeo E, Lops D, Margotti E, Ghisolfi M, Chiapasco M, Vogel G.
Long-term survival and success of oral implants in the treatment of full and partial arches: a 7-year prospective study with the ITI dental implant system. 13: Heckmann SM, Winter W, Meyer M, Weber HP, Wichmann MG.
area. Part 2: A methodical study using five types of attachment. Clin Oral Implants Res. 2001 Dec;12(6):640-7. 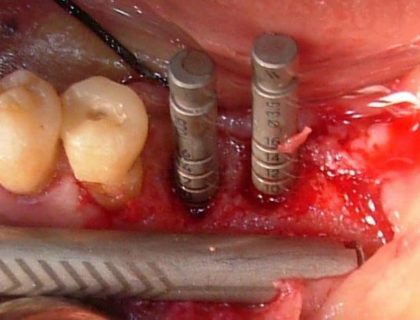 Mandibular implant-retained overdentures: a literature review. J Prosthet Dent. 2001 Nov;86(5):468-73. 15: Menicucci G, Lorenzetti M, Pera P, Preti G.
Int J Oral Maxillofac Implants. 1998 Nov-Dec;13(6):851-6. Fig.1: Buccal view of the mandibular edentulous arch. Fig.2: Occlusal view of the mandibular edentulous arch. Fig.3: Occlusal view of the surgical site before the horizontal osteotomy. Fig.4: Occlusal view of the surgical site after the regularization of the alveolar ridge profile. Fig. 5: Depth gauges inserted to verify the correct parallelism between the fixtures. Fig. 6: The holding screws showing the insertion of the fixtures as parallel between them and as perpendicular as possible to the occlusal plane. Fig. 7: Occlusal view of the post-surgical site. The closure screws were secured onto he fixtures and the soft tissues were sutured with e-PTFE coated polyfilament sutures. Fig. 8: Occlusal view of the mandibular arch 3 months after surgery. Fig. 9: The Locator® impression kit (A: 1 mm abutment; B: impression coping; C: laboratory abutment). Fig. 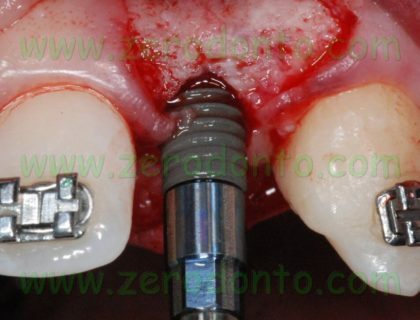 10: The 1 mm abutments were manually screwed onto the fixtures and tightened at 35 Ncm. Fig. 11: The impression copings inserted onto the abutments. Fig. 12: The laboratory abutments positioned in the master cast. Fig. 13: The housing processing males positioned onto the laboratory abutments. Fig. 14: View of the impression surface of the OVD showing the housing processing males. Fig. 15: The housing processing males removed with the relative tool. Fig. 16: The extra light retention males used to replace the housing processing males. Fig. 17: View of the impression surface of the OVD showing the extra light retention males. Fig. 18: Esthetic anatomical characterization of artificial teeth and denture. Fig. 19: Intraoral view of the OVD after finalization. Carlo Montesarchio was born in Naples in 1964. He took his Dental Technician certification in 1982; owner of his own dental laboratory since 1983. Author of publications on national and international journals, he participates in formation classes at the University “Federico II” of Naples. Lecturer for ANTLO.He collaborates with dental industries for material and technology development. 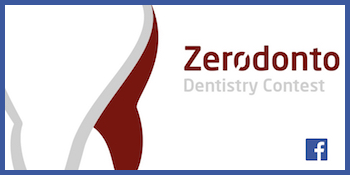 Lecturer at Master Courses of Removable Prosthodontics for VITA ZANFABRIK. He focuses all his activity on full removable dentures.His formation is linked to several experiences dealt with national and international operators. Controlled Split Crest and Guided Bone Regeneration (GBR) with contemporary implant placement: rationale and limits of the clinical application in esthetic areas.